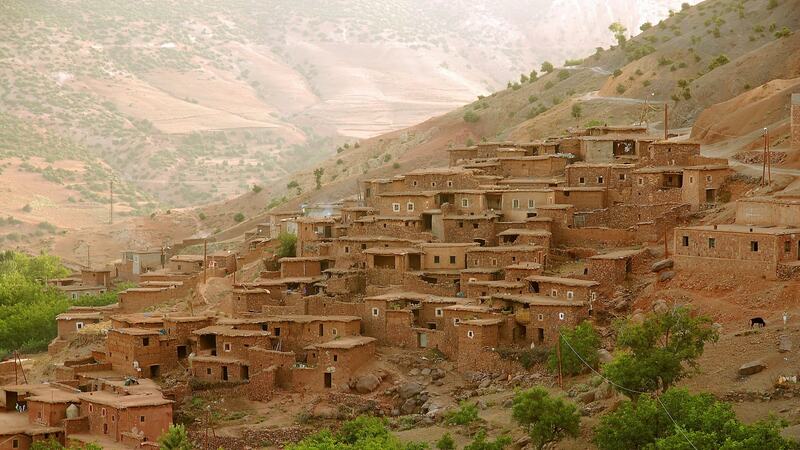 Imlil village sits at the head of a picturesque valley at the trailhead to North Africa´s highest peak Mount Toubkal. In summer it is a welcome retreat from the heat of Marrakech and in winter, the snow covered peaks add a magical air to the already stunning location. Once you arrive after a short drive from Marrakech, we propose various options like: Mule rides, cooking classes in a village house or a few hour or more walk in the woodlands and villages around Imlil with either a picnic lunch out in nature or in a secluded gite with a view to Toubkal. If you are interested in some trekking in the region, we can organise that for you too with accommodation, guides, mules and all meals. By late afternoon, we return to Marrakech and we will bring you to the place of your choice. A short visit through Armed with its narrow streets including a mint-tea in one of the local Berber houses, then walk through the irrigated terraced fields of barley, corn and vegetables and always surrounded by almond and walnut trees. The trek then continues for another half an hour until the stop for lunch which will be served among a Berber familly in the village of M’zik. After lunch you set off back down the other side of the valley back to Imlil passing by the village of Arghen, and the return trip to Marrakech.